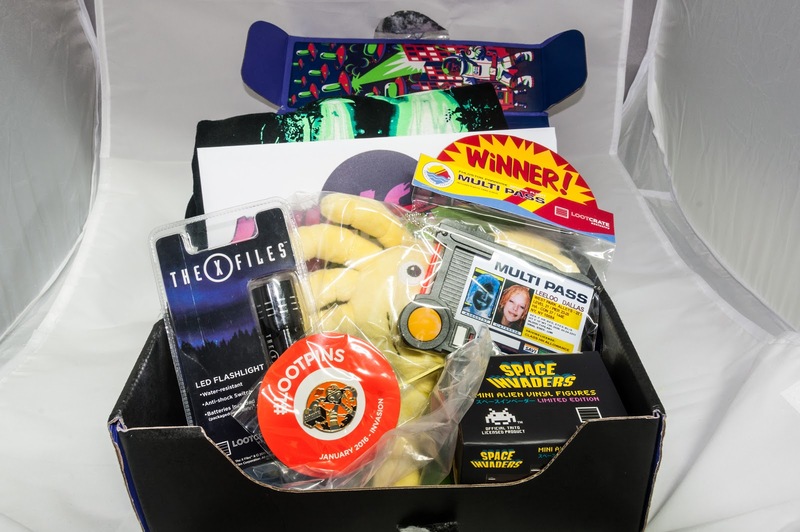 January 2016 Loot Crate Unboxing: Invasion! This month’s theme was Invasion! What kind of items did we get this month? Check out below to see our Loot. 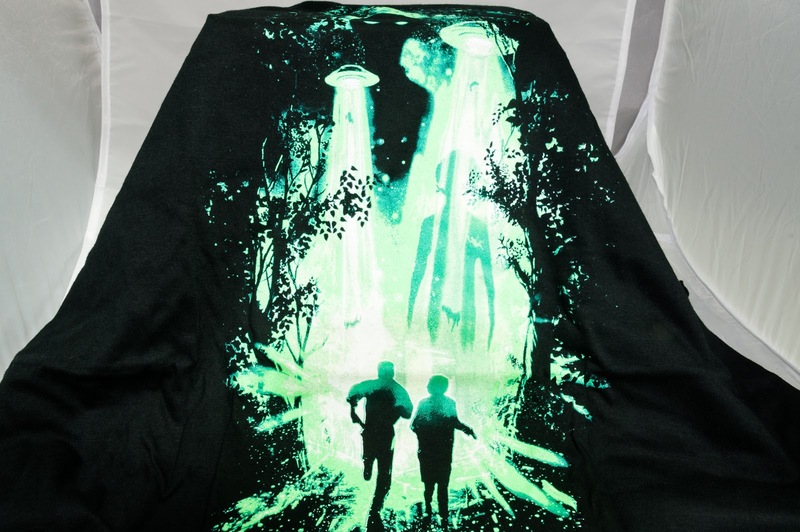 Every month Loot Crate will include a shirt and they’re starting out the new year is a shirt from the X-Files. The shirt is an exclusive and was the winner of a contest hosted by Loot Crate and Threadless. The winning artist is known as “nicebleed”. I used to watch it growing up and the theme song still gives me chills. As much as I like the show. I don’t really like the shirt. It’s an interesting design but it’s not something I would have bought for myself. I’ll probably wear it, but not often. 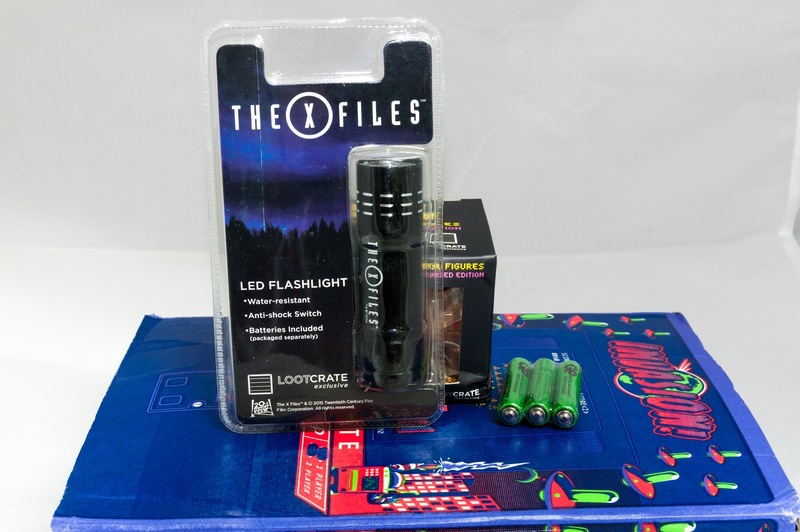 Another X-Files item is this exclusive LED flashlight. We have been experiencing some power outages so this will come in handy. I hope it’s a quality flashlight that lasts for awhile. I’m glad they came with batteries. Next up, we get a Space Invaders figure. These come in different colors but I got the orange one. Interesting figure that’s also an exclusive. This prop replica is from one of my favorite Sci-Fi movies of the 90’s. I used to watch this movie all the time since HBO would replay it frequently. 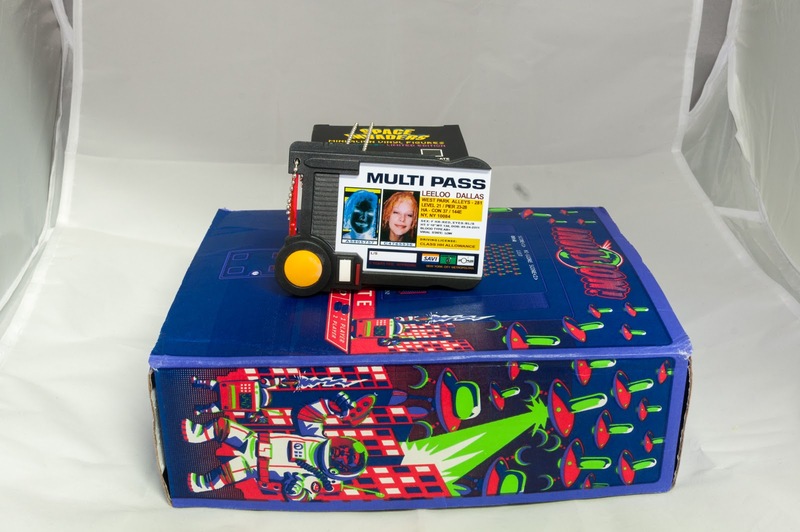 I can still hear Milla Jovovich saying “Leeloo Dallas multi pass”. I’ve noticed that Loot Crate is also including more prop replicas like the Agents of Shield badge, Hydra Pin and Galaxy Quest patch from previous crates. The item can also be turned into a conventional ID holder as well. You can insert your ID into the sleeve provided and it inserts in the holder. 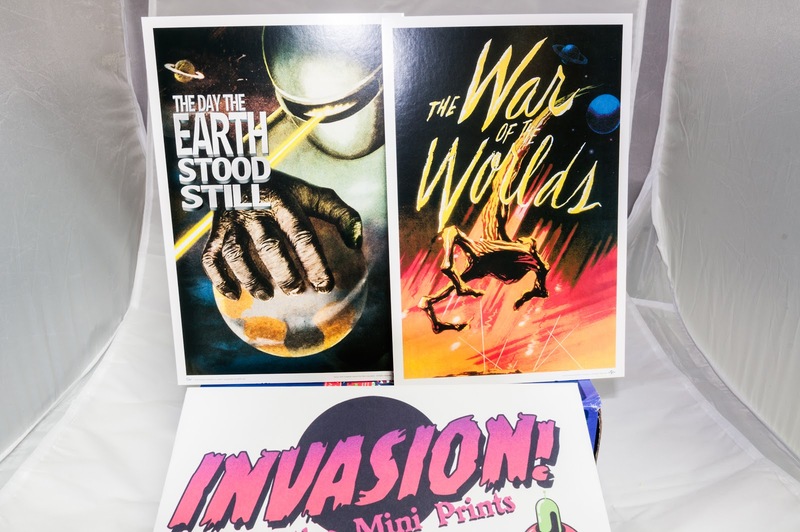 Instead of a poster the guys at Loot Crate included art prints from “War of the Worlds” and “The Day the Earth Stood Still”. Cool prints, would go well in an entertainment room. The only downside is the size. It’s about 9×6. This month, Loot Crate moved away from the theme button to metal pins. I prefer these metal pins since they look better than the buttons. The pins also comes with a digital comic download of “Letter 44” from ComiXology. 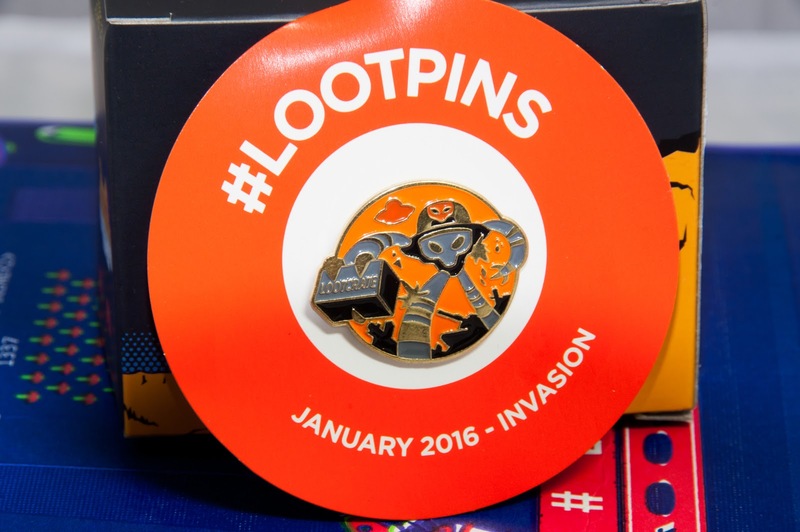 Go to LOOT CRATE PINS for more details. 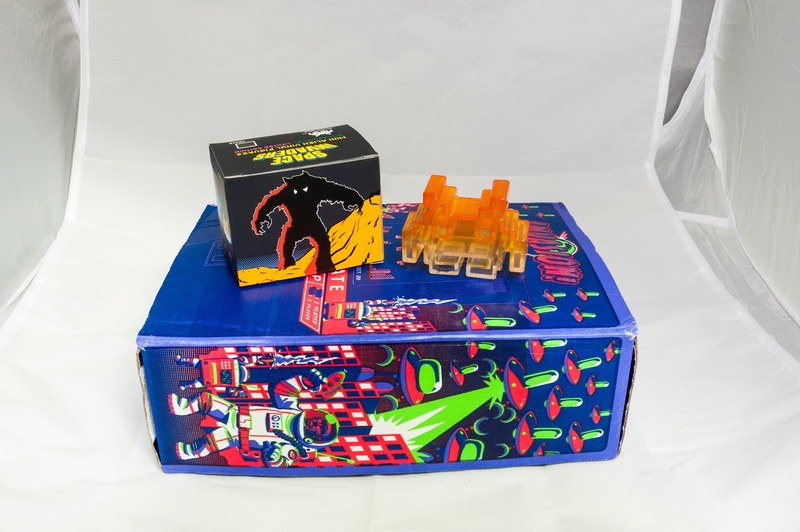 I didn’t take pictures of the box but it turns into an 80’s arcade cabinet. You can see some of it under the pictures above. I think Loot Crate did a great job with this month’s theme. All items went well with the theme but some were better than others. The shirt was a miss for me but I liked everything else. 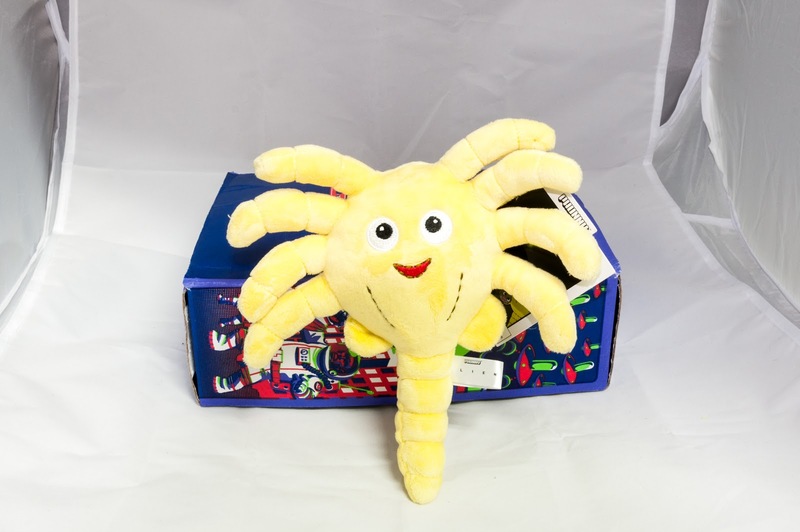 The Facehugger plush was my favorite item this month. If you want to check out more stuff for February’s theme go to HERE. Loot Crate is having a contest, a typing zombie game, and more.